Владельцы процессоров Intel Kaby Lake и AMD Ryzen не могут устанавливать обновления Windows 7 и Windows 8.1: они либо столкнутся с предупреждением, либо получат код ошибки 80240037. Патч поможет решить эту проблему. Утилитка отключает сообщение "Оборудование не поддерживается" в Windows Update, и позволяет продолжать устанавливать обновления на системах Windows 7 и 8.1 с процессорами Intel Kaby Lake, AMD Ryzen, и другими не поддерживаемыми официально. Patch disables the "Unsupported Hardware" message in Windows Update, and allows you to continue installing updates on Windows 7 and 8.1 systems with Intel Kaby Lake, AMD Ryzen, or other unsupported processors. Basically, inside a file called wuaueng.dll there are two functions: IsDeviceServiceable(void) and IsCPUSupported(void). IsDeviceServiceable(void) is essentially a wrapper around IsCPUSupported(void) that caches the result it receives and recycles it on subsequent calls. Patch takes advantage of this result caching behavior by setting the "first run" value to FALSE and the cached result to TRUE. At system boot the wufuc scheduled task runs as the NT AUTHORITY \ SYSTEM user. Way more stable and less invasive, crashes and hangs should be pretty much non-existent. Re-introduces the incompatibility with UpdatePack7R2 or other software that modify wuauserv's ServiceDll value in the registry. 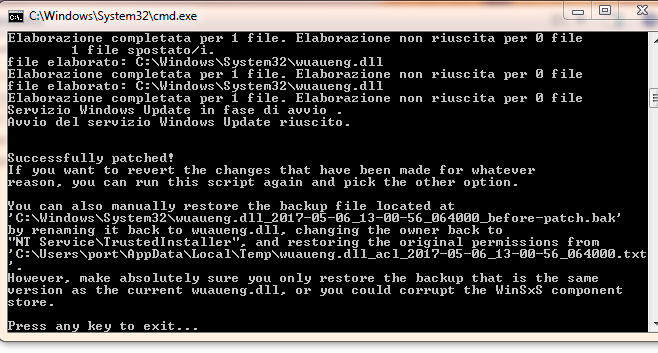 You can still work around this manually by using the provided Restore_wuauserv.reg file. Introduces a potential race condition where the "Unsupported hardware" popup could display for a short period of time before wufuc is able to patch it. Should this happen, just close the popup and it should not display again. Changed the log file text encoding format from UTF-16LE (without BOM) to UTF-8 (without BOM) to improve compatibility with various text editors.